Disney and LucasFilm's first Star Wars spin-off Rogue One hits theaters in less than a month, and while we'll certainly see more footage in the form of clips and TV spots between now and then, there are still likely plenty of secrets left to be revealed. 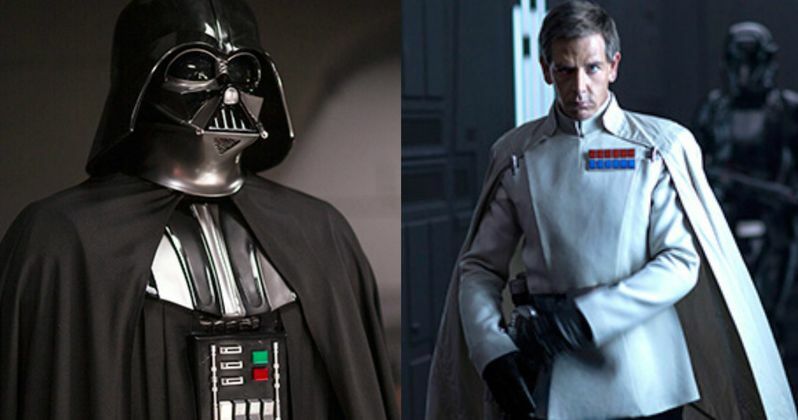 Today we have even more plot details that shed some light on the relationship between the iconic villain Darth Vader, and another Imperial leader, Director Orson Krennic. Despite fighting for the same cause, it appears there is no love lost between these characters. Entertainment Weekly caught up with LucasFilm's Kiri Hart, who is part of the company's all-important story group, which crafts ideas for the entire franchise. Krennic is the director of Advanced Weapons Research for the Imperial military, who becomes obsessed with the completion of the Death Star project. While some would think that Krennic would have a lot in common with Darth Vader, Kiri Hart revealed to Entertainment Weekly that it's just the opposite. Here's what she had to say below. "Here is the thing about Krennic: his perspective obviously is that of a person who doesn't understand the Force. And Darth Vader comes at everything from the perspective of understanding the Force. So that I think is the thing that you see sort of separating Darth Vader from other characters with regards to a super weapon like this." Director Gareth Edwards has previously teased that Krennic is more "working class" than other villains in Star Wars lore, such as Vader or Gran Moff Tarkin. Krennic is said to have succeeded through his "sheer force of personality and ideas," although he has advanced about as far as he can in the Empire. This is most likely because, unlike Tarkin and Vader, he does not believe in or understand The Force. The director also teased that Rogue One: A Star Wars Story takes the franchise in a "dark direction," and there have already been other indications that this spin-off will be much different than the Star Wars movies that have come before. LucasFilm president Kathleen Kennedy teased that this spin-off will not have an opening crawl, which she believes should be saved for only the main saga films. It remains to be seen how different the Han Solo spin-off will be from the original movies as well.